That shows hitter values in ottoneu ranging from the most to least expensive player, in each format. 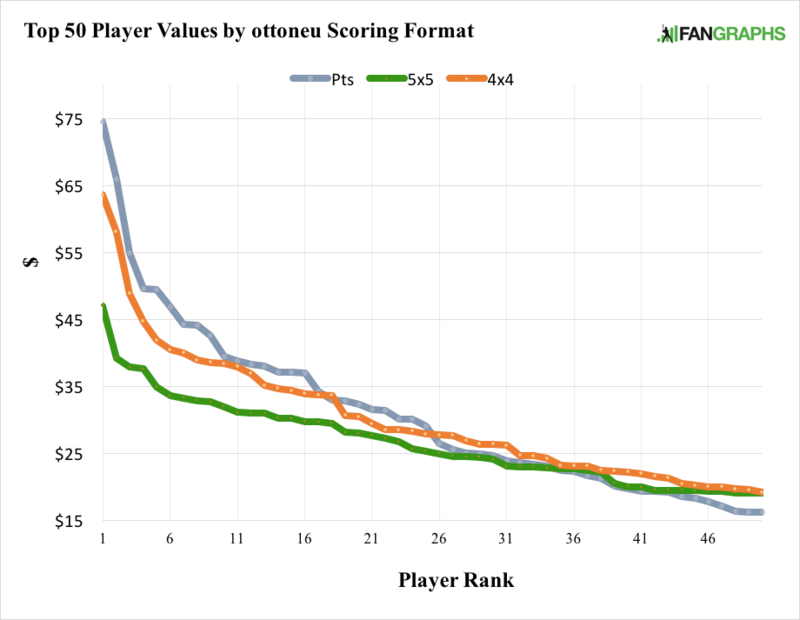 You can see, very quickly, where Trout (the priciest player in all formats by Steamer projections) sets the curve. 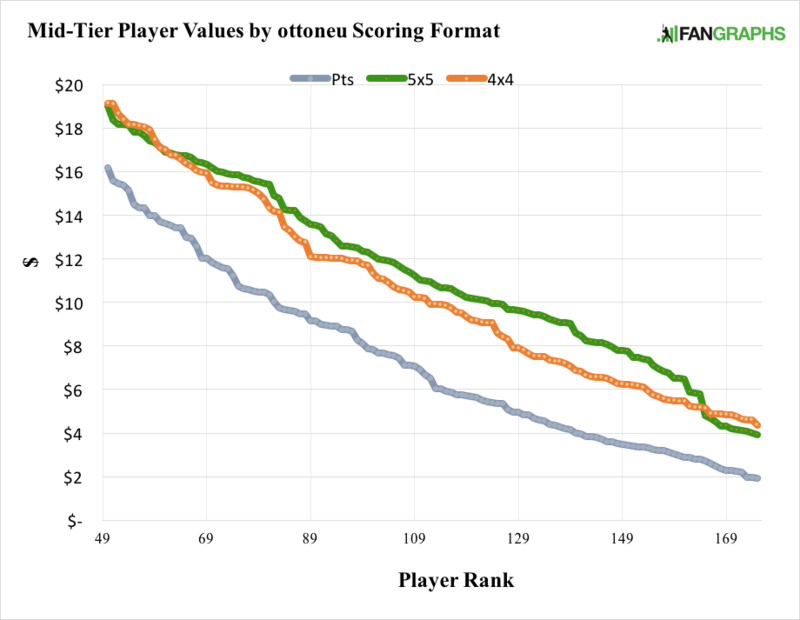 You can also see that FanGraphs points leagues drop off much quicker. 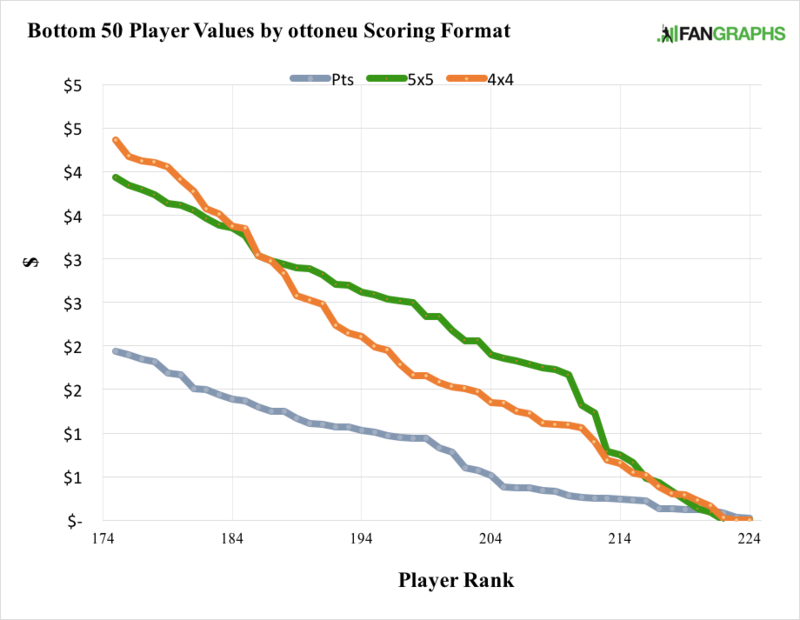 The three graphs below give you closer looks at the top, middle, and bottom tiers of hitters. The pattern is pretty clear – points has the highest peak, the steepest drop and the cheapest players near the bottom. 5×5 has the lowest peak, but has the most expensive players in the middle and cheapest tiers. 4×4 sits in the middle throughout. The reason has to do with the number of categories. 5×5 leagues have, of course, five categories for offense and five for pitching. This creates some balance in the player pool. You need to pay for SB and Saves and Wins and HR and RBI and so on. And being super-great in one of those categories has diminishing returns if you aren’t balanced enough in others to score points across the board. We don’t think of points leagues as having categories, per se, but they are effectively roto leagues with only one category – points. I don’t care if you steal three bases or get one hit – those are worth roughly the same value. And it doesn’t matter if my team steals 1K bases or 1, if I get enough points. The result is that there is no need for balance. Trout is just straight up better than everyone else. Billy Hamilton might steal 200 bases and become a stud in 5×5, but he’ll still get fewer points from that than a player who hits 30 HR. And because you can make those direct comparisons, you can easily distinguish between two players and start to push down the value of the cheapest guys. There are no one-category-heroes, guys who should be owned in 5×5, in points leagues. 4×4 sits in the middle because, well, four is between one and five (or because eight is between one and ten). This becomes an important factor when thinking about auction values – don’t pay for 5×5 Trout like you pay for a points (or even a 4×4) Trout. He’s just not worth as much. 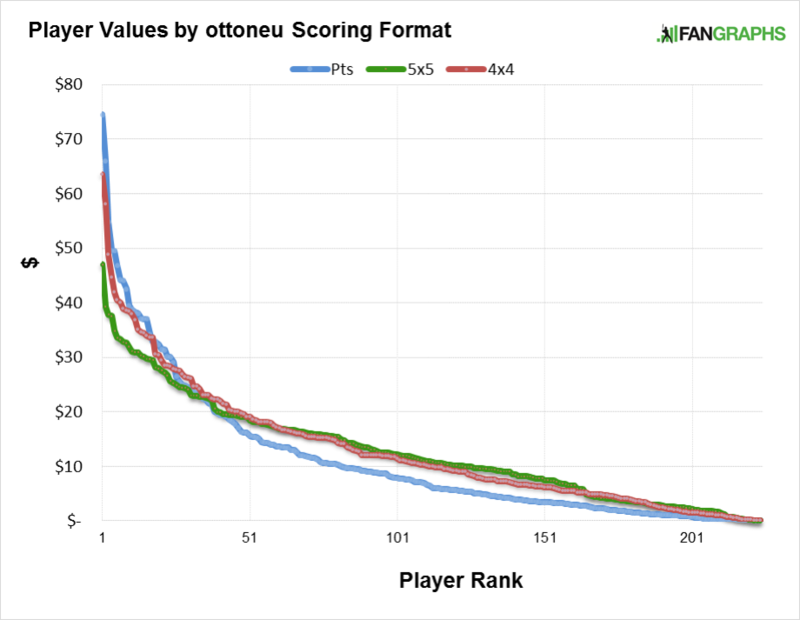 We hoped you liked reading Player Values Across ottoneu Formats by Chad Young! i’m not sure I follow the example for trout in 5×5. since he’s contributing heavily in all five categories, doesn’t that make him even *more* valuable? I actually think that is what makes Trout such a great example. He is not hurt by the scoring itself (as opposed to someone who has no speed, or is all OBP and no AVG or something) but his value is still far less. The value curve is just much shallower. The variety of ways you can get value from players means that more players have value and means that it is harder for any one player to provide irreplaceable value. cool thanks for the explanation. I’m still not sure how best to use these values in strategic terms. based on these values, every “first round” talent will be very overpriced in my league. that means even if I get lots of value, I still won’t have the raw production to actually compete. this happened to me in our first year draft last year and I’m worried it could happen again this time. would it make sense to overpay for a big bat and then try to make it up with surplus in the rest of the roster? or maybe just ignore the high priced guys and try to grab them as rentals through trades when people start selling? I think the message here is that you should, in fact, skip the big bats if people are overpaying. If people are paying on a curve that looks like points leagues, instead of paying $65 for Trout, you’ll be able to get 3-4 other players all below their value. I’ve consistently competed in my ottoneu 5×5 and have never had a full price elite bat (usually haven’t had an elite bat at all). I also dominated a H2H 6×6 league last year without a truly elite bat or any of the 10-15 most expensive players. Be smart about your auction strategy, leave the overpriced stars to others, and enjoy the profits that those who overspend leave for you.